Given recent cultural shockwaves around the eternally fraught subject of sexual politics, no one should be terribly surprised that a painting which appears to depict a suggestively posed prepubescent girl is now in the spotlight, and in the cross-hairs. Those cross-hairs take the form of a popular petition, around 8,000 signatures strong, presented this week to New York’s Metropolitan Museum. 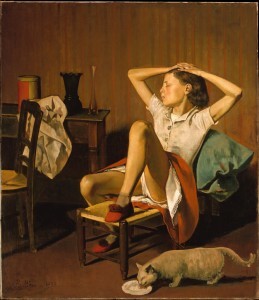 The target is Thérèse Dreaming, a 1938 work by French-Polish modernist painter Balthus (Balthasar Klossowski de Rola). Balthus’ work is perhaps deserving of such scrutiny—he had a reputation for unsavory representation of young females (his earlier work The Guitar Lesson is far more questionable—and be warned that link is decidedly NSFW). Artist’s intentions aside, we should ask ourselves whether potential objectification is, or should be, within the mind of the beholder. One interpretation could be that Thérèse is simply dreaming, or daydreaming; her innocence and lack of self-consciousness has eased her into a physical arrangement that others might sexualize, but for her is just the wholeness of the here and now. Balthus and others of malicious orientation might attempt to overlay their perversions on children, and I fully agree we should protect them from that. But I think we do them a disservice if that protection comes at the cost of their innocence and agency. Let a kid be a kid, in other words. In any case, and possibly because the petition itself was rather ambiguous (its title included the phrase “Remove Balthus’ Suggestive Painting,” but the text contradicted that, and merely called for The Met to “more carefully vet” its collection), the museum declined to take action. Specifically, The Met confirmed that the painting will remain on display, and welcomes the conversation it has sparked. Which, I assert, is a pretty admirable position. Art should challenge, and we need to talk about those challenges. Yes, the exploitation of vulnerable populations is reprehensible, all the more so because it’s been done with impunity for most of human history. We’re at a watershed moment where that impunity is being knocked back on its heels. But is there risk of overreach? And might that overreach include artistic censorship? Hard questions, with no easy answers. And that’s why we need to talk it through. This entry was posted in New Post and tagged Art, Balthus, Metropolitan Museum, The Met, Therese Dreaming, What is art? censorship. Bookmark the permalink.